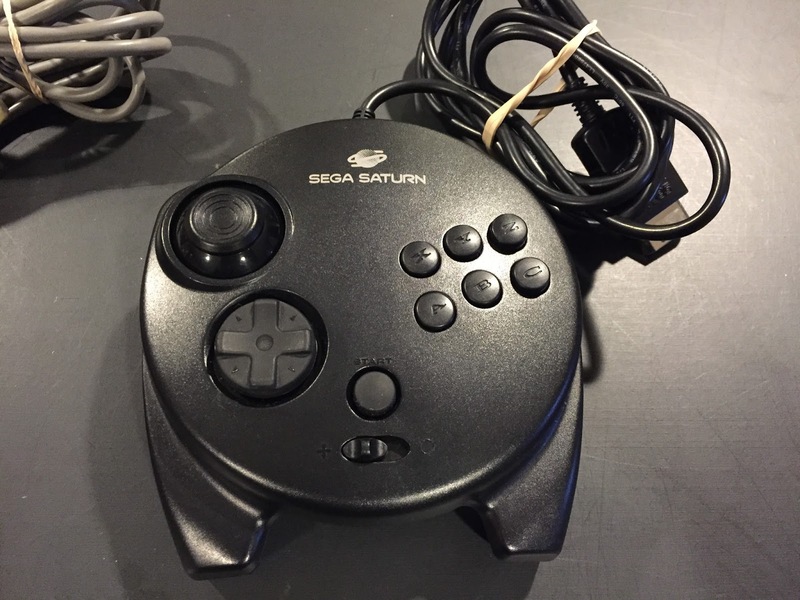 The Sega Saturn is coveted by retro gamers for various reasons, one of which is for the excellent controller. The initial North American model released with a blocky, large contraption best described as plastic hamburger. This was literally a handful, and not a controller that I'd recommend. I no longer own this model as I sold, knowing I wouldn't use it. 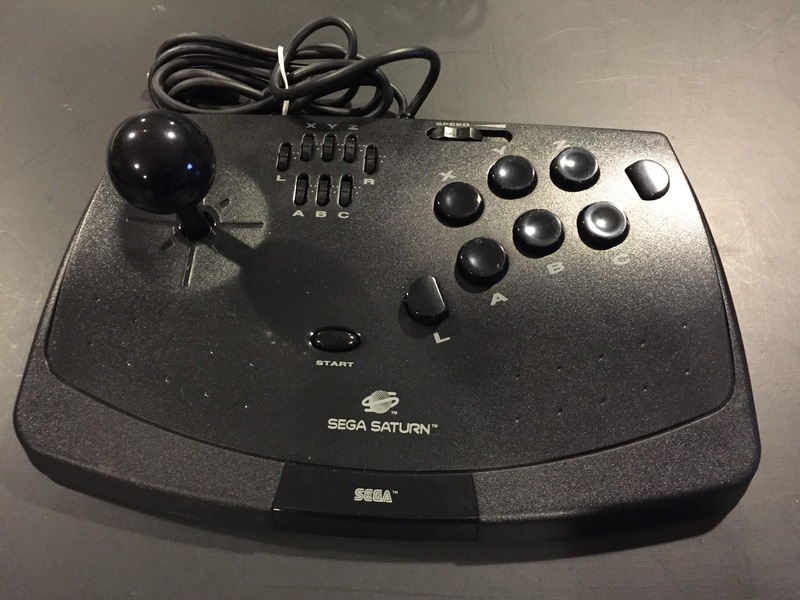 The model two Saturn was packaged with the Japanese version of the controller, which became the standard, and is what people are referring to when they mention "Saturn controller". What makes the controller awesome is its d-pad. It is firm enough to offer sufficient feedback, yet smooth enough to not cause fatigue or blisters, even after hours of use. No other d-pad before or since has offered the same comfort and effectiveness. There are six face buttons in two rows, with the three bottom buttons larger and concave, and the three top buttons a bit smaller and slightly convex. There are also two shoulder buttons, L and R. A start button sits in the center of it all, underneath the logo. The overall shape is reminiscent of the six-button Genesis controller revision, which is a vary natural shape to hold. If I had any complaint, it would be that the shoulder buttons click depth seems a bit flimsy and shallow. Not a big deal in the grand scheme, as they are not used as much as the face buttons. It is not hard to see why it is considered my many to be the best 2D controller ever made. If I could, I would use it for all of my retro systems. When Nights into Dreams released, it was packaged with the 3D controller. The Overall shape is primarily round, with handle-like ridges on both sides molded into the design. It visually very obvious that it is the predecessor to the Dreamcast's controller, but it is more comfortable to hold. 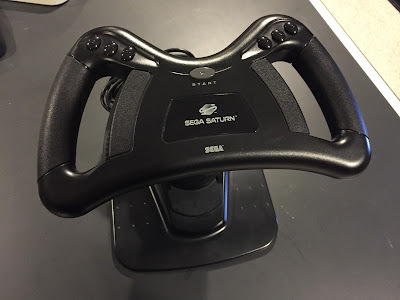 The analog pad is a mixed bag: for being one of the first analog controls, it was decent, but it seemed like it had a dead spot in the center as the tension releases towards the center. 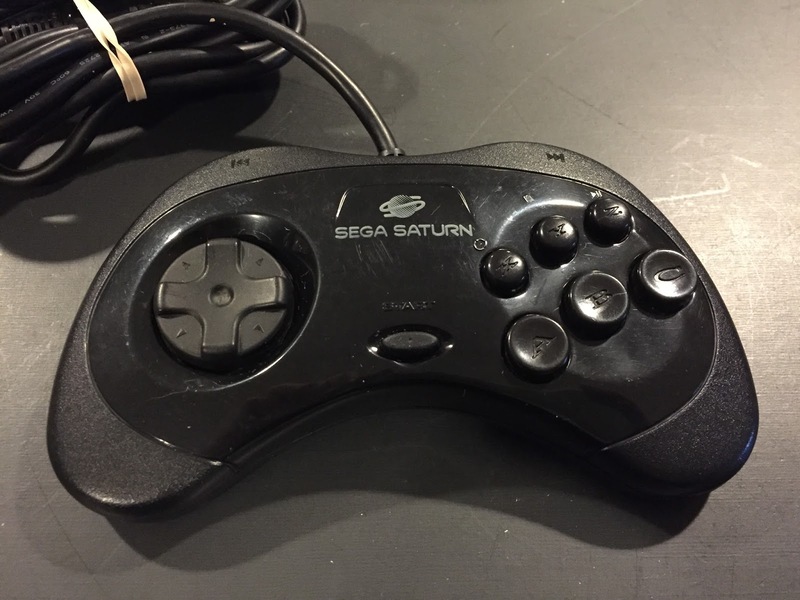 This analog pad was the driving force for the existence of the controller, so that it could be used in the Saturn's 3D catalog. I guess it works for those games, but those are not favorite anyway. There are six equally-sized face buttons, and this time they are all convex. The shoulder buttons were replaced by deep-pulling triggers that seem like they would be pressure sensitive, and I'm not sure if they are or not. Maybe someone can let me know. Again, the d-pad is excellent. I rarely use the analog pad, as it is nowhere near as good as the d-pad. I go back and forth between which controller I like better; the model 2 or the 3D. My favorite games on the system are shoot' em ups and fighters, both of which are spectacular with either controller. Eventually, I sought out an arcade stick for the fighters. Even with the awesome standard controllers, the plethora of fighters on the system yearned for an arcade stick. 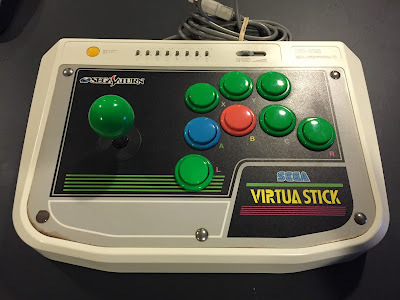 So I went online and quickly picked up a Virtua Stick. It was touted as "a must have for Virtua Fighter", on the box, although I prefer 2D to 3D fighters. This has an eight button layout (L and R are included on the front), which is 2 more than I needed. It was a few bucks, and was a pretty minimal risk. When it arrived, I was excited to put it through its paces. It was fun, but I found it lacking...precision. Gross movements were fine, but finer movements were not there. This was made apparent while playing Street Fighter Zero 2 and 3. While I'm not a great player, I can normally pull off special moves eight out of ten times. This stick had me down to about five out of ten. There had to be something better. I researched more thoroughly than the first time and narrowed the field down to two: the SS Hori Fighting Stick and the Sega Virtua Stick (not the aforementioned black one, the Japanese-only white arcade stick). Both had similar ratings, accolades, and prices. I found a good deal on the Hori and went with it. It has a nice, tight stick with a heavy base. The buttons are good, but not quite arcade quality. They have microswitches in them, but don't have that punchy spring back that good arcade buttons have. 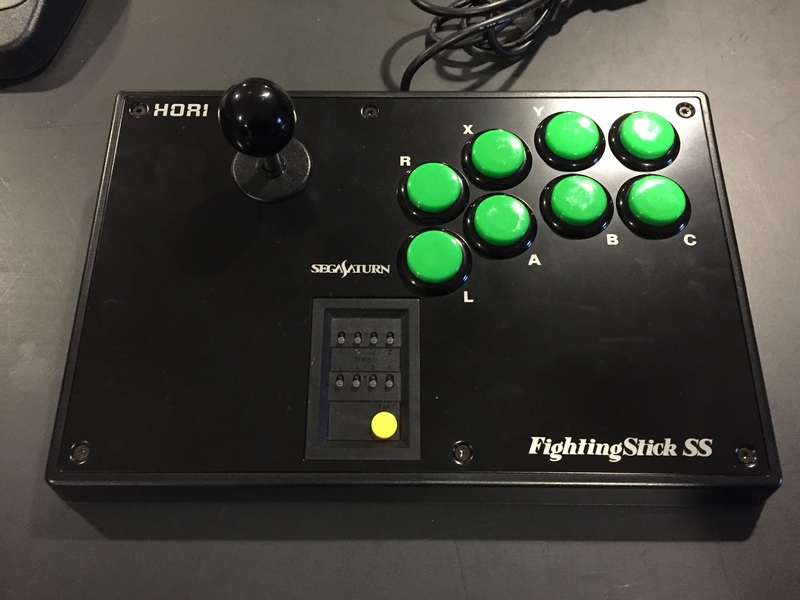 Still, its a great stick and it earned its way into my controller rotation for the Saturn. I was satisfied for a quite a while. A couple of years later, Japanese Virtua Stick caught my attention on eBay, and was going unnoticed as far as bids. I threw a few bucks at it, got outbid once, threw a few more at it and got it for under $20! Of course shipping doubled that, but to get such a quality stick at a fraction of the going rate was a no-brainer. Part of me felt like I didn't really need it, but when it arrived, that changed quickly. The stick is a bit looser, and I actually prefer that. Microswitches are present, yet they feel less restrictive than the Hori. The buttons are micro-switched as well, and are an improvement over the Hori as well as they have a clicky snap to them. I prefer this stick over the Hori, for both shooters and fighters. I'm glad to have both, though. I may as well mention there is a double-Virtua Stick, and I believe it is literally the same panel from a Japanese Sega arcade cabinet. It is HUGE, and of course it compatible with the Saturn out of the box. I have not seen one in person, but all online reviews state it to be top notch. Because of its quality, size, and rarity, it carries a steep price tag. I love the Saturn, but I don't know where I'd put this thing when playing or not. A curiosity for sure, but the line has to be drawn somewhere. Or, never say never I guess. A few years ago I was curious about driving games for the Saturn. There are a lot of them, and like shooters and fighters, no Japanese literacy is required. These are dirt cheap, as there were so many and its not the hot topic on the Saturn, so they are currently overlooked. After playing a few, I realized the excellent Saturn controllers were just not up to the task of the microsteering necessary in some of these racing games. Low and behold, the Saturn racing wheel. Its not actually a wheel, more like a racing handle? Again, its not in high demand so it wasn't pricey at the retro game shop that I frequent. It has a base that you sit between your legs, and the wheel/handle telescopes outward, and is adjustable. It works better if you are sitting on a firm surface, as a soft seat will make the base of the wheel feel unstable and wobbly. It definitely makes the driving games more fun and more responsive. There's not much worse than constantly oversteering into wall after wall while driving 150 mph. Makes driving at high speeds possible. 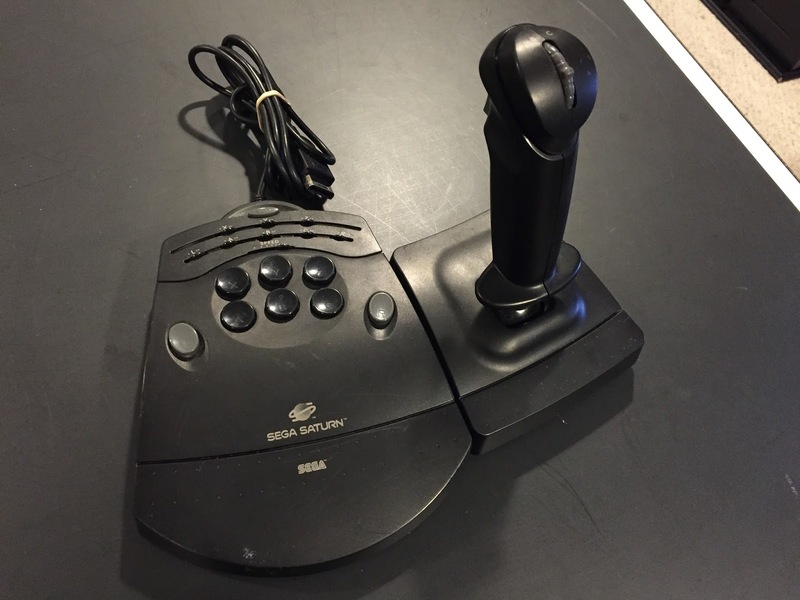 I knew about the Mission Stick controller, but wasn't quite sure what it was for. I was watching an episode of Game Sack on YouTube, and they were covering the Saturn and Joe was playing Space Harrier with it. Of course! Space Harrier and After Burner were meant to be played with a pilot-like stick with a trigger. This thing wasn't really cheap, mainly due to its rarity and size. It has a large base, and packing it would be awkward, needing a larger box than you'd think you need, driving up the postage. 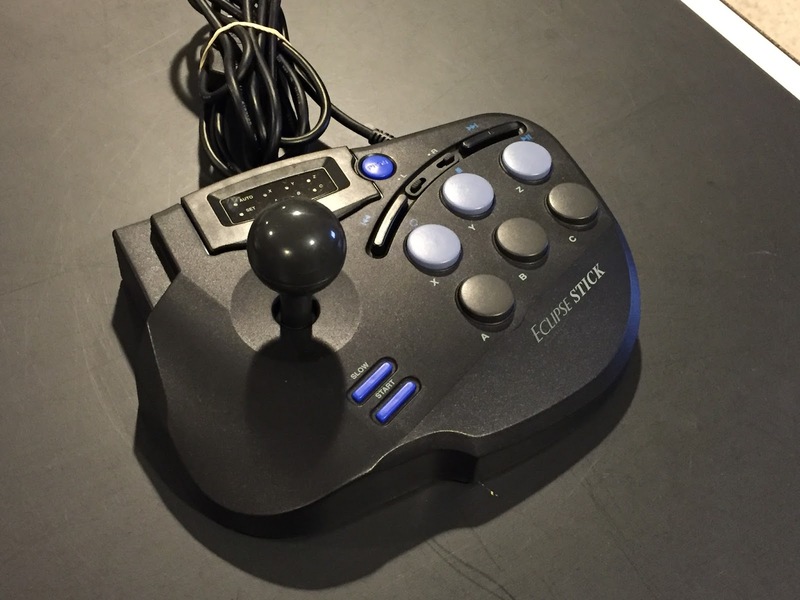 I did see a Saturn bundle on Shopgoodwill.com, which included a Saturn, controller, Mission Stick, and a third-party joystick called the Eclipse Stick. This lot was about $40, plus $20 shipping. I kept the sticks and flipped the system on eBay, coming out ahead. The Mission Stick takes some getting used to. While I though it would be so intuitive, my muscle memory of playing these games on a standard controller did not translate well to the Mission Stick. While I do remember playing these games in the arcade, that was a long time ago and my hands have forgotten. Maybe I'll give it a few more tries, but I think I like the regular controllers here. The Eclipse stick that came along for the ride is just another third party stick. It's meh. Ok, that's not fair. At this point I already have the Virtua Arcade stick and the Hori, so there is no reason to use this. It controls fine, the buttons are typical, and there is a programmable button feature, but I wasn't inclined to use it. The base is small, so if you're setting it on your lap, its not very comfortable as you have to keep your legs together to support it. I also have the Sega Stunner light gun, and its fine, but that's not really for this post. I hope this was helpful in some way, and maybe someone decides to buy a controller mentioned based on this post. Have a good day.